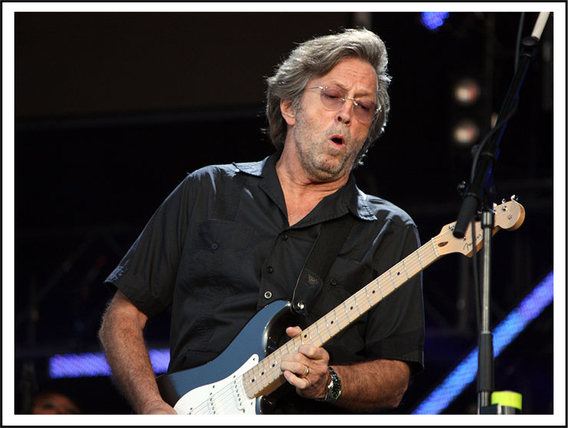 Eric "Slowhand" Clapton is one of the most respected guitarists and musicians in the world today. He got his nickname in 1964 while playing with The Yardbirds. It was fondly invented by Yardbirds manager Giorgio Gomelsky when Clapton broke a string and would change it on stage thus delaying the show. The audience responded (when he took too long) by giving him a slow hand clap. So the nickname "Slowhand" was coined. I've been a fan of the blues all my life. Leadbelly,Sonny Terry and Brownie McGhee, I couldn't get enough of them. I played the Blues Breakers (aka The Beano album) LP by John Mayall so many times that I wore it out. John Mayall was one of the most influential blues musicians in England at the time. His band consisted of : John Mayall on piano, Hammond organ, vocals, and blues harp, Eric Clapton on guitar, John McVie, (who joined Fleetwood Mac shortly after it was formed in 1967) on bass and Hughie Flint on drums (Alexis Korner and Savoy Brown and Bonzo Dog Band) Mayall also used a horn section consisting of Alan Skidmore, Johnny Almond, and Derek Healey. The guitar that Eric Clapton played during the recording of Blues Breakers was a 1960 Gibson Les Paul Standard with two humbucking pickups. In 1966 shortly after the recording of Blues Breakers that guitar was stolen along with other equipment from Clapton's van. On that same day John Mayall was booked to perform (in the basement) below The Brighton Aquarium on the south coast of England. My friend David and I (the one who'd helped me wear out The Beano album) had managed to buy 2 tickets to the show that night. At the appointed time, we arrived. The band finally "hit" the stage and Eric Clapton immediately walked to the microphone and explained to us about the van robbery earlier that day. He'd managed to borrow a guitar for the night, but discovered he was short a plectrum (Brit speak for guitar pick) My friend David (who ironically later became a highly acclaimed blues drummer,) without missing a beat, produced the requested pick, that'd probably been lying dormant in his pocket amongst candy wrappers for decades and offered it to Clapton, who gratefully accepted the loan, going on to perform one of the greatest concerts of his life. After the gig Clapton bounded off the stage walked up to David and I, and with a huge smile and a sincere thanks, he returned the plectrum. David told me that he unfortunately lost the pick, when he finally cleaned out his pockets six months later!! The Yardbirds began to get noticed in the burgeoning rhythm and blues world after they started working at the Crawdaddy Club, and ultimately became known as a "who's who" of the British music scene at the time, producing artists like, Jimmy Page (Led Zeppelin) Jeff Beck (Beck, Bogert & Appice) and of course Eric Clapton amongst others. The time spent at the Crawdaddy Club playing with The Yardbirds allowed the musicians to hone their craft with a repertoire drawing on their love of Chicago blues. Songs like "Good Morning Little Schoolgirl" and "Smokestack Lightning" became Yardbird staples, while the audiences that packed The Crawdaddy Club each night couldn't get enough of the music of Bo Diddley, Muddy Waters, and Howlin' Wolf. A few years later when they were playing with Led Zeppelin, Jimmy Page and John Paul Jones recorded "Bring it On Home" by Sonny Boy Williamson. Eric Clapton had never been a disciple of commercial success and in 1965, he left the Yardbirds, shortly after they released For Your Love that went on to become a huge hit for them. But Clapton wanted to be a blues purist, and joined Mayall in 1965. In 1966 Eric Clapton left John Mayall Bluesbreakers (being replaced by Pete Green) and was invited by drummer Ginger Baker (Graham Bond Organization) to join his new group along with Jack Bruce (Manfred Mann and The Graham Bond Organization) The new group was to be called Cream. I'd first seen Ginger Baker with The Graham Bond Organization. Ginger Baker, became known as "rock & rolls first superstar drummer," and was famous for his lengthy drum solos and flamboyant style of percussion ( even more flamboyant than Keith Moon of The Who) (I remember a 19-minute solo with the GBO, where we all stood hypnotized by his talent, percussive skill, and energy) so the natural fit of Jack, Ginger and Eric was immediately electric. By the time I graduated from high school in 1967 Clapton was being touted as Britain's top guitarist and Cream were becoming enormous in the US as well. In March 1967 they performed a 9 show sell out at the RKO Theatre in New York. They recorded Disraeli Gears in May 1967 in New York that included Clapton's searing guitar work and Baker's polyrhythmic percussive techniques. 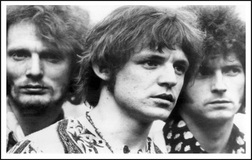 The short lived life of Cream was accelerated by the tensions between Baker and Bruce coupled with the excessive use of drugs by the band members. The demise of the group affected Clapton profoundly. In 1999, Disraeli Gears, Creams defining LP was inducted into the Grammy Hall of Fame. By 1969 Eric Clapton who by now was a household name decided to form Blind Faith, with Ginger Baker, Steve Winwood (Traffic) and Ric Grech. (Family) Initially Clapton was hesitant to invite Baker to play with him again, so soon after Cream had disbanded (It'd been just 9 weeks since the break up) but Stevie Winwood while jamming with him at his home in Surrey south of London, convinced Clapton that Baker would add significant power to the new "super group." 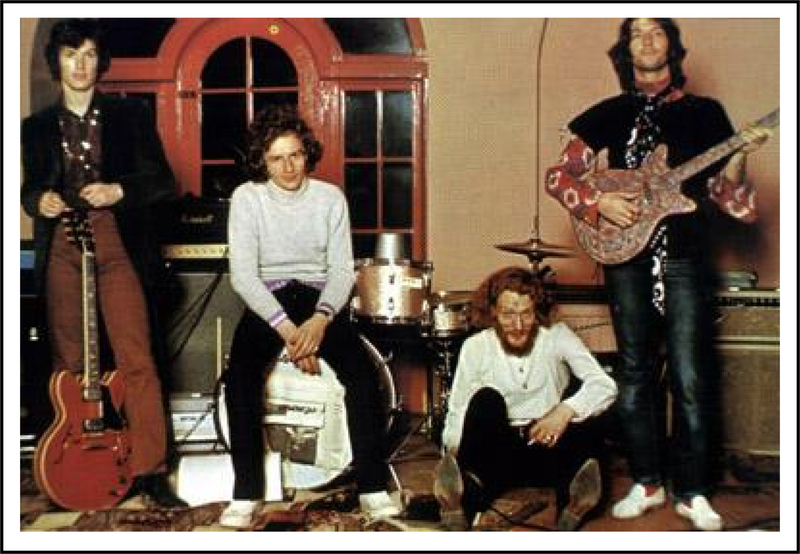 In May 1969 Ric Grech was also formally invited to join them, and Blind Faith (Baker,Grech,Clapton and Stevie Winwood) debuted at a "free" concert in London's Hyde Park on June 7th 1969. Over 100,000 people attended that day. Steve Winwood was signed to Island Records (his brother and former bandmate Muff Winwood ((Spencer Davis Group-worked at Island as an A&R man)) so subsequently Blind Faith was "leased" to Polydor Records. Having toured in the US and Scandinavia just once and producing one LP "Blind Faith," the band dissolved after just 7 months with Eric Clapton joining Delaney and Bonnie as a sideman. During his stint with Delaney and Bonnie, Clapton recorded with, Leon Russell, Billy Preston, and Dave Mason. He also added his unique guitar style to Stephen Stills' song "Go Back Home"
Clapton has received respect from both rockers and blues players. He's broken racial stereotypes and is equally loved by both genders. He's overcome personal pain, beyond what most people could bear, and turned all that emotional roughage into songs like "Layla" and 'Tears in Heaven". "Layla" was originally released in 1970 when he was with the blues/rock band Derek and The Dominos. The song was inspired by a poem called "The Story of Layla and Majnun" from 5th century Arabia about unrequited love. Clapton's love affair with Patti Boyd (George Harrison's former wife) has been much written about and clearly caused him a great deal of pain. The searing guitar in the opening of "Layla" sparks an almost tribal response in all of us. "Layla" has withstood the test of time, The acoustic version of 'Layla" won the 1993 Grammy for "Best Rock Song" over 20 years after its first release proving it resonated with a new generation. Clapton's personal relationship with the blues go way beyond disappointment in romance. His personal life reads like a Greek tragedy. 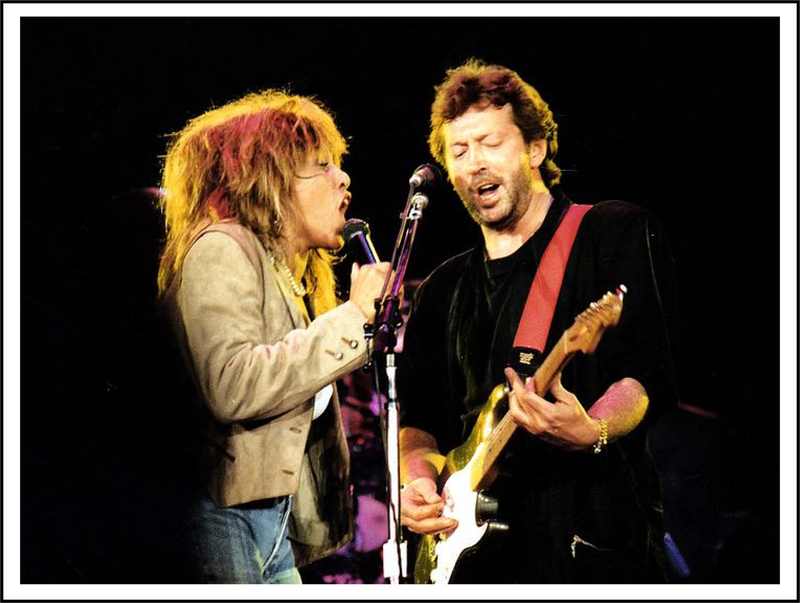 Clapton is a man who grew up believing that his 16-year-old Mum, Patricia, was his sister. Because society was so rigid about teen pregnancy, he was raised by his maternal Grandmother Rose and her husband Jack. Eric Clapton never got to meet his Canadian Father, Edward Fryer, (who played piano and saxophone,) because he didn't learn of him in time and his father died young of leukemia. Yet, Clapton pressed on and developed his amazing musical talent. He impacted and developed so many musical friendships around the globe including Jimi Hendrix, Duane Allman, and Jim Gordon only to lose them tragically to death and mental health issues. Clapton said of Duane Allman, "He was the musical brother I'd never had but wished I did". Clapton then fell in love with a woman (Pattie Boyd) he couldn't have, which drove him to struggle with substance abuse and brutal press coverage. When he emerged and finally "won the girl", their brief marriage was painfully marred by the inability to have children. During the turbulence, he had an affair with Lory Del Santo which produced a son, more bad press, and destroyed his marriage to Pattie Boyd, the love of his life. But, he emerged again and loved his son Conor. He continued to produce and perform amazing music only to lose his beloved son to a tragic, freak accident only 4 1/2 years later. He has had incredible loss in his life. To lose a child and then be able to produce "Tears in Heaven" is extraordinary. No wonder so many great blues musicians respect Clapton. It is not just his great playing, but his life that makes him authentic. 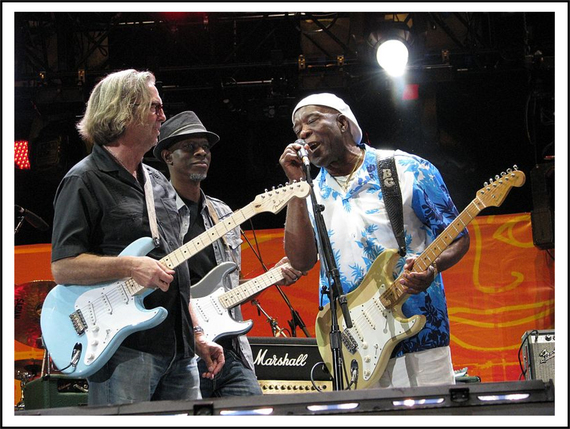 Just like the great short film about the legendary Sonny Terry, Clapton's life is "Shoutin' the Blues". When we pause to marvel at his talent, we should also marvel at his spirit and his tenacity. The great American novelist Walter Mosley in "The Last Days of Ptolemy Grey" wrote, "The Great Man say that life is pain. That mean, if you love life, then you love the hurt that come along with it. Now, if that ain't the blues, I don't know what is." Leon Redbone, the Canadian/American guitarist said, "The Blues ain't nothing but a good man feeling bad". Eric Clapton plays from the inside out, like no one else we've ever heard. In 1997 Eric Clapton founded The Crossroads Center whose "commitment has been to provide treatment of the highest quality and integrity, while optimally supporting the dignity of individuals and their families suffering from the effects of alcohol and other drug addictions." The center is based in Antigua. Clapton explains the reason why he founded Crossroads. "As a recovering addict and alcoholic, many people over the years spoke with me about the problems associated with drug and alcohol abuse on the island. Subsequently, around 1993, I began to speak with more and more people about the possibility of founding a Centre on the island for the treatment of drug and alcohol addiction. There was certainly a need, and so the dream and the vision were born." "My vision was to create a Centre of the highest caliber to treat people of the Caribbean and throughout the world. The Centre would be staffed with experienced and internationally recognized professionals. The cost of treatment would be held to the lowest possible level, ensuring affordability and accessibility. And most importantly, this non-profit Centre would provide treatment scholarships for people of the Caribbean region and around the world." Eric Clapton has received 18 Grammy Awards, and the Brit Award for Outstanding Contribution to Music. He's been inducted into the Rock and Roll Hall of Fame three times. Once as a solo artist, once as a member of The Yardbirds, and once as a member of Cream. He's also been ranked second in Rolling Stones magazine 100 Greatest Guitarists of all time.